Jordi Savall nails his colours to the mast by giving his Biber CD the subtitle of Baroque Splendour and that is exactly what you get. The central work on the disc is the astonishing Missa Salisburgensis, but Savall surrounds this with a range of other works, choral and instrumental, that show this remarkable composer off to a dazzling degree. It's my greatest musical discovery of the year so far. A musician of Savall's quality doesn't go about an enterprise like this by half measures. In his own booklet note — which contains some occasionally rather purple prose — he describes his discovery of Biber and the journey by which he came to this disc. 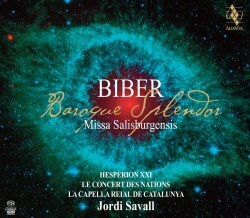 It's recorded in Cardona Castle in Catalunya, a favourite Savall venue, and this allows him to make the absolute most of the polychoral potentialities of Biber's music. The acoustic is wide, resonant and feels vast; and I was listening only in stereo: in SACD it must be stunning. Right from the opening you know that this disc means business. In the opening Fanfare the drums and multiple trumpets seem to feed off each other, resonating around the huge acoustic in a way that evokes majesty, ceremony and, indeed, splendour. This leads naturally into the motet Plaudite tympana, whose mood is utterly in keeping with the opening fanfare, all swaggering pomp and boisterous grandeur. It's very well sung but the effect when the voices, trumpets and drums all combine is breathtaking, and the engineers deserve credit for capturing it so faithfully. Both the motet and the mass were (probably) written to commemorate the 1,100th anniversary of the founding of the archbishopric of Salzburg by Saint Rupert, and one work whets the appetite for the other. The opening Kyrie of the mass really hits you between the eyes when it begins, with the quiet confidence of the choir against the understated splendour of the musicians. It then grows organically into something very exciting, much like the rest of the mass. The Gloria is appropriately named, with thrilling repetitions of the word "Pax" for the full chorus and orchestra, and I loved the spiralling lines of the final moments. The Credo is where the thrill of the polychoral writing makes itself most evident, alternating the massive choral moments with enchanting solo lines. The Sanctus begins with excitable, almost childish repetitions of the text, before leading into a huge, resplendent vision of the Benedictus, via a joyous Hosanna that recurs at the end. The final Agnus Dei relies on huge symmetries and steadily moving lines to make its very substantial impact. Savall's direction is rock-solid throughout, keeping control of the various threads with absolute surety, and ensuring that the mood is both dramatic and devotional; no mean feat. The other instrumental numbers are great, too. The Sonata Sancti Polycarpi is full of radiant confidence and dancerly swagger, while the Battalia for strings is beautifully played, and thus sounds surprisingly tender in places, full of delicacy and wit rather than merely ram-stamming its way through. It's full of wonderful textures and is another surprise on this delightful disc. Typically for Alia Vox, the booklet notes are excellent, both from a musicological and a historical point of view. Full texts and translations are given, together with some beautiful illustrations. Overall, tremendous.